Sioux Princess may never win a Dominion Handicap but will be a valued broodmare later in life, being related to Dominion winners, Marcoola, Amaretto Sun and Lyell Creek. The lightly-raced Majestic Son mare brought up her second win from only six starts when taking out the 3000m Club Waimea Trot in a 2:06.3 mile rate at Nelson on Sunday. She maintained a strong finish wide out to win by a length from Unique Marshall and Shpeedy. “I have got her to race then breed from,” said trainer Mark Jones. “She will just race though. I hope she gets better as she has got a little bit of speed,” he said. This was her first win for the Mark Jones stable, having won her debut at long odds for Lawrence McCormick at Addington last May, then undergoing an ownership change. Amaretto Sun, shown winning the 2017 Dominion for driver, Sheree Tomlinson. Sioux Princess belongs to the same maternal family. Photo: Race Images, Christchurch). Sioux Princess’s win added to the season of leading junior reinswoman, Sheree Tomlinson, who racked up her 27th win of the term, while this was Mark’s 16th training win for the season. Both Sheree and Mark have enjoyed feature success with the family of Sioux Princess, a daughter of three-win mare Westwood Sioux, by Sundon from Lady Chiola, by Chiola Hanover-Blue Duck, by Tuft-Kahu. Sheree reined Amaretto Sun (by Sundon-Laurel Creek, by Wingspread-Kahlum, by Noodlum-Kahu Del, by Armbro Del-Tee Kahu, by Tuft-Kahu), trained by her grand-father Ken Ford, for her first Group One victory in the 2017 Dominion. The Ford-Tomlinson family were to the fore again this season with brilliant four lengths Dominion winner, Marcoola (Sundon-Arabess, by Grant Our Wishes-Laurel Creek). Mark had a direct association with Lyell Creek (by Roydon Glen-Kahlum), driving him to win his final North American start at Woodbine, Canada, in 2003, shortly after the horseman’s World Driving Championship triumph there. Lyell “Creek the Freak” returned to finish his NZ career with three further wins, including a third Dominion Handicap, and a Rowe Cup. The remarkable 1:52.4 USA-winning square-gaiter retired a winner of 56 races in seven countries, for $2.96 million in stakes. Kahlum, the unraced Noodlum dam of Lyell Creek; grand-dam of Amaretto Sun, and great grand-dam of Marcoola; is also a half-sister to smart pacers, Swan Creek (eight wins), Harnetts Creek (13 wins), and Cullen’s Creek (1:56.9, Aust, 14 wins & $141,761). Kahola, another half-sister to Kahlum, is the dam of the ill-fated Kahdon (t, 1:59.3, six wins and five seconds from 14 starts for $177,234), who Mark also had a winning association. Mark reined Kahdon for second to Vulcan in the 2010 Harness Jewels 3YO Ruby at Cambridge following her purchase by Australian owner Peter Chambers. He then trained her just two Australian starts, winning the Group One Victorian Trotting Oaks, then finishing second to Rostevarren in a Victoria Trotting Derby Heat. Kahdon’s half-brother is the useful winner Matatoki (1:59.6, Aust, 10 wins from 43 starts). Kahlum is also the grand-dam of other smart pacers in Bettor’s Creek (1:56.1, 10 wins), Donegal Kahlum (1:54.9, seven wins) and Donegal Carrickfin (1:57.2, five wins). This is also the family of 3YO filly pacer Vi Lee (Prodigal Seelster-Mackles Creek, TT: 1:56.6, by Holmes Hanover-Why Not Girl, by Smooth Fella-Kahu Del), who Mark drove to win at Winton last month for fellow Canterbury trainer, Stephen Boyd; and Stoney Creek (10 NZ wins, 1:55.2, US). 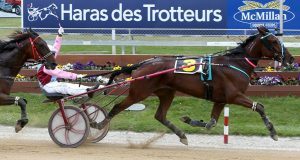 Kahu Del, the five-win dam of Kahlum, also left 2002 2YO Trotting Filly of the Year Lough Neagh, the dam of other smart trotters in Le Reveur (t, 1:57.6 US, six NZ trot wins) and Arboe (t, 1:55.5, Aust, seven wins), Ballyronan (t, 1:58.1, seven wins), Jay Pe De (t, 2:00.6, seven wins) and Ima Bourbon Girl (t, 1:57.8, seven wins). Polar Blast, an unraced Muscles Yankee daughter of Kahu Del, is the dam of Ronald J (t, 1:58.7, nine wins) and Quevert (six wins). While it’s early days in the career of Sioux Princess, she looks capable of taking a higher rating for the stable and adding to one of NZ’s top trotting pedigrees.